Strong winds connected to Storm Doris have triggered yellow and amber weather warnings across Wales. The Met Office issued the warnings on Wednesday, covering the whole of Wales from 06:00 to 20:00 GMT on Thursday. 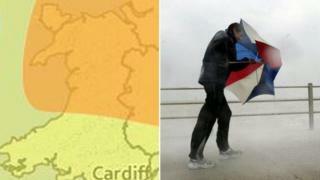 Gusts of up to 80mph are said to be likely in mid and north Wales, with a "danger of injury from flying debris". There is also likely to be "damage to structures, interruptions to power supplies and widespread disruption to travel networks" in some areas. The chief forecaster said: "There is still some uncertainty about the track of storm Doris, but increasing confidence that there will be widespread disruption across parts of England and Wales." The amber be prepared warning covers Conwy, Denbighshire, Flintshire, Gwynedd, Anglesey, Powys, Wrexham and Ceredigion. While the strongest winds are expected to be short-lived, the Met Office warned of potential damage, danger and disruption, with trees likely to be damaged or blown over. Gusts of 60-70mph are likely, with 70-80mph winds on coasts and hills. The less serious yellow warning, urging people to be aware, covers a wider area. Gusts of 50-60mph are expected, with the risk of 70mph on coasts and hills. The Met Office said: "Travel services could be affected including some restrictions on bridges and disruption to ferries. Some damage to trees and buildings is also possible."